Here are the city of Cleveland’s “protest zone” rules for the 1.7 square miles around the GOP Convention next week, where thousands of people will be expressing their conflicting views. They don’t allow selfie sticks or lightbulbs. Leave all sabers at home, please, along with any nunchucks, shovels, or Christmas tree ornaments. If you were planning on staying for the duration, no hammocks or mattresses, either. But feel perfectly free to carry a gun—or two or three—in plain sight. No water guns or air rifles are permitted, either: Your gun must actually use bullets in order to bring it to the venue. In short, the state’s open-carry firearms law apparently supersedes any cautionary rules made by the city. A number of organizations intend to take advantage. Some organizations intend to “support the police” (without having been asked to do so) and others say that they will use their firearms purely for self-defense. We are sending a letter to Governor Kasich requesting assistance from him…He could very easily do some kind of executive order or something—I don’t care if it’s constitutional or not at this point. They can fight about it after the RNC, or they can lift it after the RNC, but I want him to absolutely outlaw open-carry in Cuyahoga County until this RNC is over. However, Emmalee Kalmbach, a spokeswoman for the governor, said in a later statement that the governor could not suspend open-carry at the convention. Law enforcement is a noble, essential calling and we all grieve that we’ve again seen attacks on officers. Ohio governors do not have the power to arbitrarily suspend federal and state constitutional rights or state laws as suggested. The bonds between our communities and police must be reset and rebuilt—as we’re doing in Ohio—so our communities and officers can both be safe. Everyone has an important role to play in that renewal. At a news conference yesterday morning, Police Chief Calvin D. Williams said that Cleveland’s police would not impede the Second Amendment rights of the protesters, but neither would they be allowed to menace anyone with those weapons—or be perceived as being menacing. Do guns and college go together? 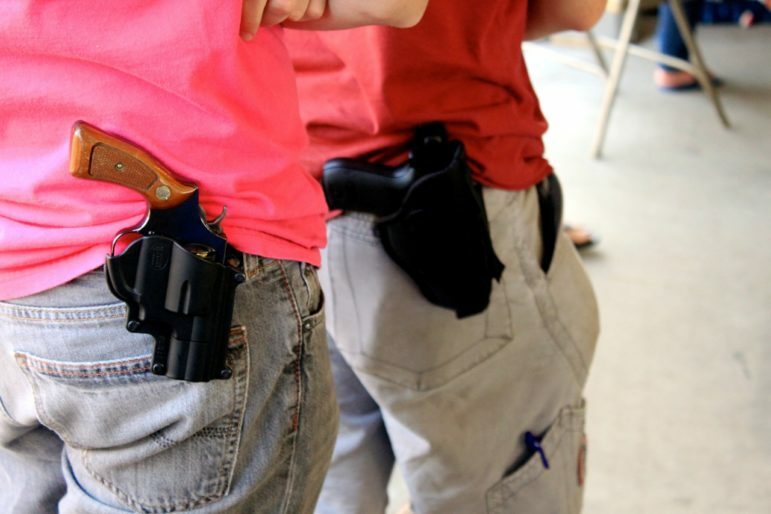 In Texas, new concealed weapons laws allowing some to “carry” worry students and faculty. While online rating systems for individual professors can be fairly brutal, at least one professor says he’d rather not get in the crosshairs of a student when guns are allowed on campus.